The 2019 Alfa Romeo 4C is most comfortable on the racetrack, so opt for the performance suspension for sharper handling at the expense of ride comfort. If you’re looking for Italian performance and character at a (somewhat) reasonable price, look no further than the 2019 Alfa Romeo 4C. Just don’t expect to be particularly comfortable. It's a rare car that's far better than its rating in some ways yet far worse in others. Telepathic handling and feedback as well as impressive power from a small engine are high points, but the build quality, rough ride, lack of amenities, and tiny cabin leave something to be desired. 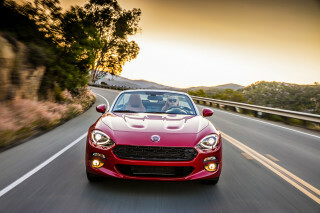 For 2019, the coupe model is gone but the removable roof Spider gets some appealing standard and optional features, including a backup camera, cruise control, and rear parking sensors right out of the box, and the option for a new suspension, a microfiber steering wheel, and carbon fiber mirrors with an Italian flag design. The 4C is best served as a second vehicle (or third) meant entirely for fun. 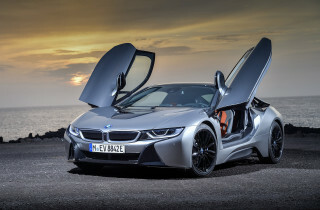 It looks as special as supercars costing several times as much, with an unconventional, exaggerated mid-engine design. While it can be cumbersome on the highway or in low-speed parking lot maneuvers due to the rough ride and unassisted steering, these characteristics make it come alive on a race track or twisty back road. A potent, snarling 1.8-liter (which Alfa calls 1.75-liter) turbo-4 makes 237 horsepower sent through the rear wheels via a 6-speed dual-clutch transmission. Its mid-engine layout and lightweight construction make for balanced handling and excellent grip. Inside, the 4C has very little to offer, from shoddy build quality and materials to a stereo that might as well be an iPhone in a red plastic cup. It also lacks any modern safety features beyond airbags and anti-lock brakes and hasn’t been crash tested because of its extremely low sales volume. Thanks to its tiny engine, the 4C manages 28 mpg combined, better than many sports cars. Curvy and expressive in all the right places, the 2019 Alfa Romeo 4C continues to turn heads like supercars costing multiple times as much. The nose comes distinctly to a point with the famous triangular Alfa grille, and the bug-like headlights give the 4C a unique face that’s sure to turn heads if not only to find out what it is. Exaggerated curves and intake scoops sweep back towards the rear, which houses the relatively small power plant between two enormous rear haunches. The twin, round taillights hark back to the Tipo 33 Stradale race car of the 1960s, and though the 4C is certainly short, it’s also deceptively wide for such a small car. Inside, there’s very little design to speak of, with a driver-oriented dashboard that features a radio head unit looking straight out of a Pep Boys catalog. The seats are properly racy, however, and the exposed pieces of the carbon fiber tub give this car’s intentions away immediately. The digital gauges are functional but somewhat boring, and do change color depending on your selection of drive mode in with the “DNA” switch: red for Dynamic, gray for Natural, and blue for All-Weather. 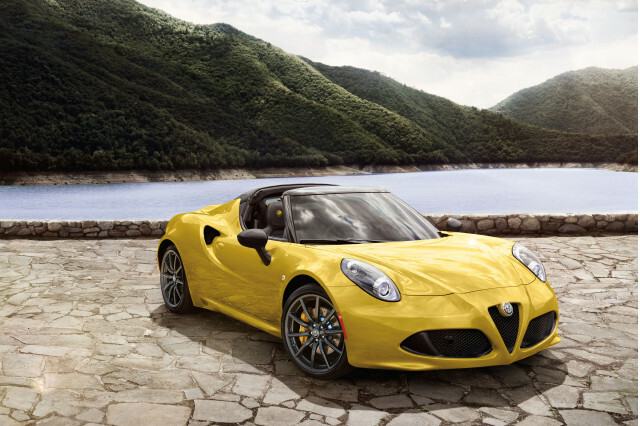 The 2019 Alfa Romeo 4C proves that there is sometimes a replacement for displacement and is most at home on a twisty road or race track. The 4C’s stand out characteristics are its handling, steering, and braking, aided by an impossibly light curb weight of just under 2,500 pounds. For comparison, the Porsche 718 Boxster is 500 pounds heavier, while the Jaguar F-Type is nearly 900 pounds heavier. A completely unassisted steering rack is a pain to operate at low speeds because of the thickness of the tires, but at speed, it’s wonderfully communicative and direct. The Alfa’s carbon tub design not only makes it lighter, but increases stiffness, and a mid-engine layout gives the car incredible weight and handling balance. Look behind the cabin, though, and you won’t find a big V-8 like many mid-engine supercars. Instead, the 4C makes use of a 1.75-liter turbocharged 4-cylinder, which makes 237 horsepower and 258 pound-feet of torque, enough to rocket the little Italian to 60 mph in just 4.5 seconds. We’d normally round that figure up to 1.8 liters, but Alfisti with an eye for the brand’s heritage will appreciate that 1,750 cc figure. Though it may be small, the Alfa’s engine is intent on making itself heard, with a raucous exhaust note and plenty of turbocharger waste gate “whoosh” noises when you let off the accelerator. 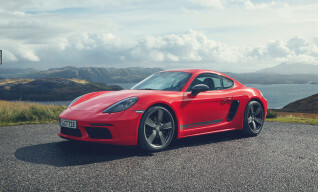 Power is delivered to the rear wheels via a 6-speed dual-clutch automatic transmission, which like the steering rack, comes alive when pushed but struggles at lower speeds. Twelve-inch, four-piston brakes up front help the 4C stop from 60 mph in less than 100 feet, but the floor-hinged brake pedal is sensitive and can make the whole car feel a bit unstable under heavy braking. And don’t hit those brakes mid-corner unless you’re aiming to go for a spin. The ride is stiff and made even stiffer with the optional performance suspension and staggered 18- and 19-inch wheels front and rear, but the standard 17- and 18-inch spokes don’t help ride quality much at all. A tight cabin, low-quality materials, and little-to-no amenities make it clear that the 2019 Alfa Romeo 4C is meant for one thing only: driving fast. The 2019 Alfa Romeo 4C wants you to love it despite its many flaws, most of which have to do with the interior. Still, at full tilt, we challenge you not to have a smile on your face behind the wheel of this raucous rocket. The 4C now only comes in roofless Spider only, which may make climbing into it just a little bit easier if you leave the roof off at all times. Otherwise, the 4C is difficult to get in and out of and can be downright punishing on long drives or poorly-paved roads. Headroom inside is good, but with two occupants, the cabin is incredibly tight. The seats provide little cushioning or adjustability, and many of the plastics wouldn’t even feel at home in a Fiat 500, let alone a car that costs three times as much. There’s no glove compartment either, only an elastic net strapped to the bottom of the dashboard, and the climate controls intrude into passenger leg space with a sharp plastic rear panel that can poke and prod. The 4C’s front end is sealed off and offers no cargo space, while the rear compartment has a tiny cubby that only measures 3.7 cubic feet, hardly enough for two backpacks let alone carry-on luggage. Oh, and don’t bother using the radio. It might as well be an iPhone in a red plastic cup at a college party. You’ll want to listen to the engine noise instead anyways. The 2019 Alfa Romeo 4C has never been crash tested in the States and likely never will be and includes no active safety features. Don’t crash. While no active safety features are available, the 4C does at least offer dual front airbags, side airbags, a driver’s-side knee airbag, and hill-start assist for the dual-clutch transmission. A backup camera and rear parking sensors are now standard where they once were optional, making reversing a less guess-worthy affair. The 2019 Alfa Romeo 4C is short on features but includes some available options for those looking to customize their already rare ride. Unfortunately for fixed-roof fans, the 4C is now only available in soft-top Spider form, with a lift-off cloth roof that stows neatly in the trunk when folded. Standard equipment includes air conditioning, automatic headlights, cloth sport seats with manual adjustment, a leather-wrapped flat-bottom steering wheel, a 7.0-inch digital instrument cluster, staggered 17- and 18-inch wheels on summer performance tires, and a juvenile Alpine stereo with Bluetooth and a USB port. 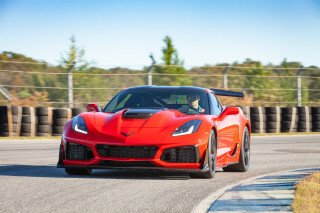 For 2019, rear parking sensors and a backup camera are standard, and a new race-tuned suspension setup, microfiber steering wheel, and carbon fiber mirrors are optional, all of which used to be part of the track package. 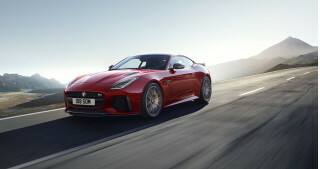 Other options include various interior packages with leather and carbon accents, as well as upgraded wheels, xenon headlights, painted brake calipers, and an upgraded exhaust. We’d suggest spending as much as you can on anything performance-related and doing away with the rest. The 2019 Alfa Romeo 4C benefits from a small engine that’s thriftier than many sports cars with similar performance. In its one powertrain and transmission option, the 4C manages 24 mpg in the city, 34 on the highway, and 28 combined. For comparison, that’s at least 3 mpg combined better than the Porsche 718 Boxster, though the Porsche does offer more power while the Alfa is several hundred pounds lighter.